We understand that our residents want to ensure a reasonable overall cost of living. With that in mind, Black Mountain Estates homes have been designed in accordance with rigorous energy efficiency standards. The building materials and floor plans of our homes have been optimized for minimal energy usage. As a resident of Black Mountain Estates, you are responsible only for rent, renters insurance, electricity/gas, and internet/cable/phone. That means we take care of: trash collection, water, sewer, property taxes, home insurance, maintenance of grounds (landscaping, lawn care, snow removal), home repairs and maintenance, and all common areas. 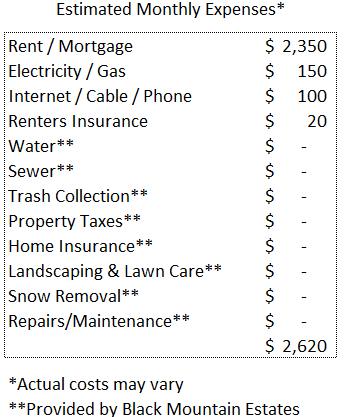 The chart below includes a breakdown of estimated monthly expenses for a typical Black Mountain Estates home. Click here to learn more about securing a steady cash flow during your retirement.